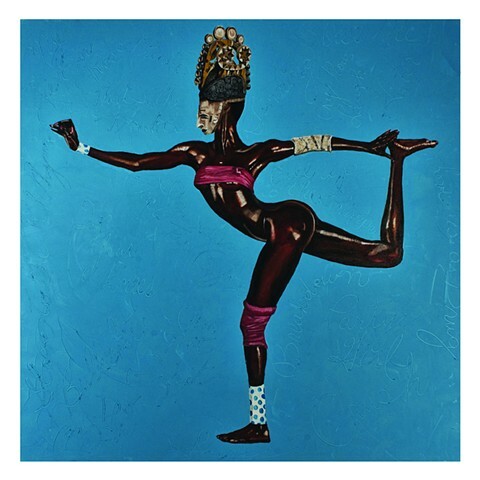 This limited edition print of the African Diva Project painting featured here is of the famous R&B disco diva Grace Jones. She is wearing an Igbo mask. Each square canvas in the African Diva Project is modeled after a 12-inch LP album cover featuring a portrait of a popular black female soloist. Every Diva wears an African mask, chosen for its character and/or aesthetic compatibility to her image. In Africa, masks (many depicting powerful female deities or ancestors) are worn almost exclusively by men. These dynamic female performers are given agency and protection replacing their psychological mask with a literal one. Songs – messages that once rose out of vinyl channels like black magic – are inscribed in the space that surrounds them. Side One of the project includes 33 1/3 paintings. The original painting was created in 2010. Oil and cold wax on canvas and paper, 48 x 48 inches. Tucker Contemporary Art Limited Editions are printed with archival pigment inks on museum-quality 100% cotton archival fine art paper for maximum integrity and longevity. The editions are hand numbered, signed by the artist and come with a signed certificate of authenticity.